We all buy concert t-shirts, but what do you buy yourself when you visit the opera, orchestra or symphony on that special night out? 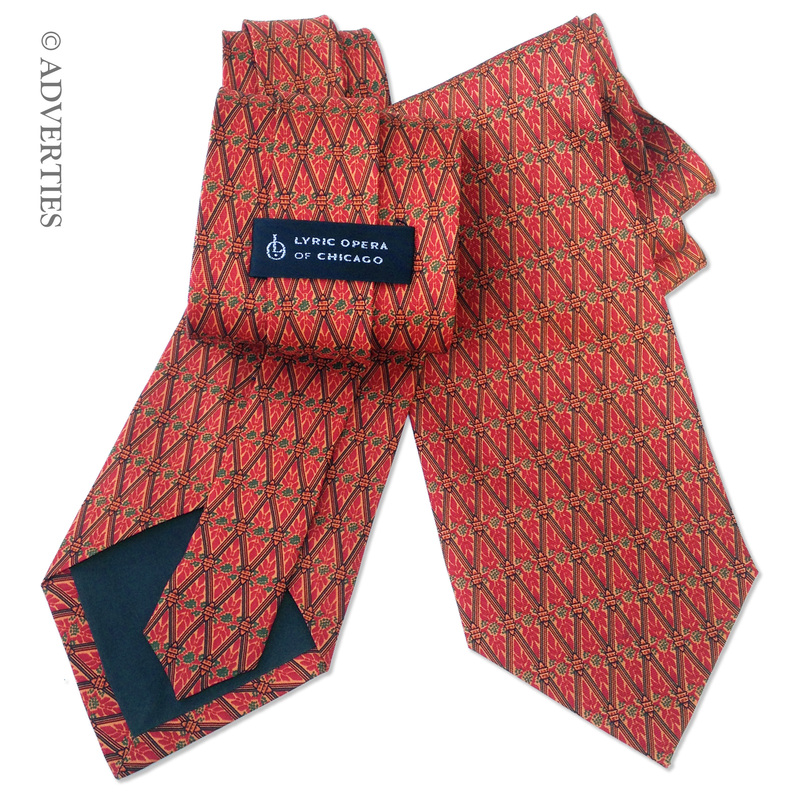 Adverties Neckwear was asked to capture the architectural design of the Lyric Opera of Chicago for upscale wearables. This magnificent building was our inspiration. It contains so much art and history within its walls. Using the architectural elements and color combinations shown in the ceiling and columns, our art department was able to create a beautiful collection of custom made neckties and scarves. Aside from custom neckties and scarves that feature a company’s logo, these upscale wearables were designed with the idea that they would reflect a high-end retail look that could be worn on many other occasions. Colors were chosen to represent the brilliant display of colors depicted on the walls of the Chicago Lyric Opera house. A necktie and scarf design were laid out to capture the historic beauty of the interior architecture. Because there was no logo placement on the front of the necktie, the Lyric Opera chose to add a custom company label on the back side. These wearable treasures became the perfect items to add to their product line. 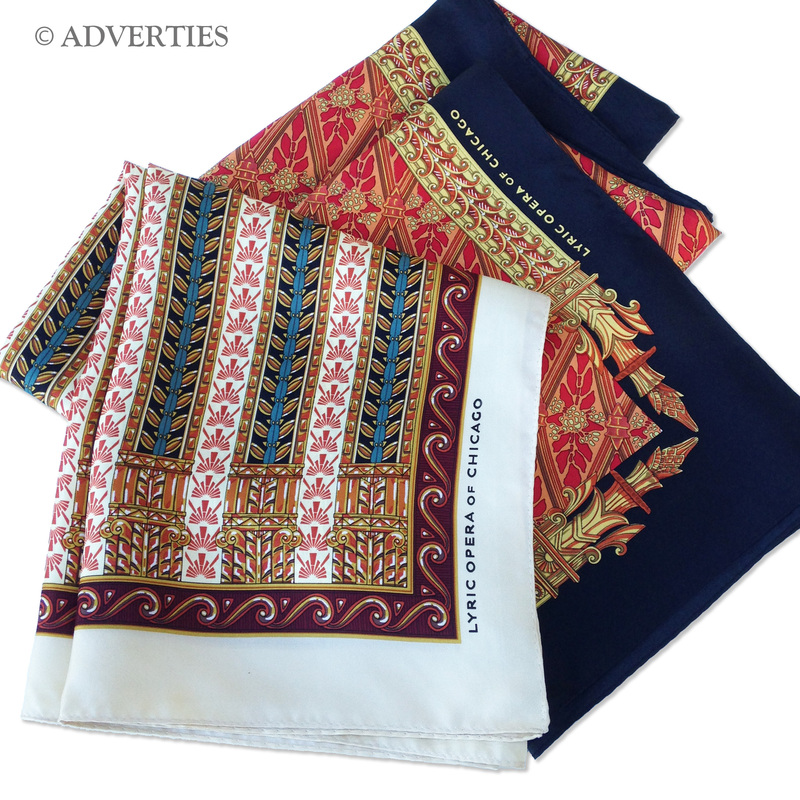 Made with fine silk and hand rolled edges, these upscale wearables sold out quickly in their gift shop. Upscale wearables such as custom neckties and scarves give people the option to showcase their night at the opera or symphony by wearing these items to work, dinner with friends or other formal events. Consider adding custom upscale wearables to your gift shop that give your customers an alternative option when purchasing memorable gifts. Custom neckties and scarves with an all-over print have endless possibilities in design. These products are made to display an unlimited imagination whether it be architecture, fine art or a musical theme.